Flower essences heal and transform through vibrational contact with the human energy field. A flower essence offers us the healing power of the natural world. Each essence contains the vibrational pattern of the plant from which it was made. The subtle healing power of the flower's form upon our etheric or emotional body reverberates throughout our physical and psychic reality. Flower essences heal and transform through vibrational contact with the human energy field. They are not herbal or aromatherapy substances, and have no chemical properties from the flowers. Because they contain no physical structures of the plants they are drawn from, they can be made from many plants which would otherwise be harmful. They have some connection with homeopathic medicine. Because flower essences are used at a vibratory or pattern level, they can be taken in conjunction with other medications. They are not substitutes for appropriate medical care. They will speed and ease the process of healing, often revealing deeper issues which the body is trying to communicate through symptoms of our physical or psychic distress. Before, during and after the gathering of the essence, I listen to the plant and ask for her guidance. I float blossoms on water in a glass bowl where they are permeated with sunlight over several hours. The water, stabilized with brandy or vinegar becomes the stock from which I take dosage portions. With study and practice, flower essences can be made from any flower, wild or garden-cultivated, which draws our interest. When I make a flower essence, it is crucial that I listen to the plants closely and observe the action of the essence, in order to be a partner with nature in the healing process. How are Flower Essences Chosen? As an astrologer, as well as a flower essence practitioner, I have combined my knowledge to assist me in choosing flower essences. As a flower essence practitioner I have been trained to hear in the client's description of a question or tangled issue, clues as to the flower essence(s) which will move the problem toward healing. 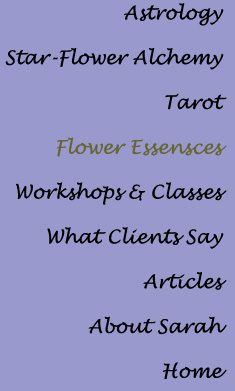 I have the experience of listening to clients and to the essences in a way which can provide a very direct connection between the client and the healing power of the flowers. As an astrologer, as well as a flower essence practitioner, I have combined my knowledge to assist me in choosing flower essences. I use the client's chart to pinpoint issues which flower essences might address, and take astrological signatures of the flower into account when choosing a formula or essence. How are Flower Essences Taken? The essence is dropped into the mouth on the area under the tongue. They can be dropped in a glass of water to drink, or added to bath water, or sprayed in a room. Essences may be taken one at a time or in a combination called a formula. They are stored in glass medicine bottles with droppers. A certain number of drops and certain number of times per day is prescribed. (Alium giganteum) This large purple flower, which grows on a tall single stalk, originates in Persia. She is a globe of flowers, each a tiny star, and offers a mandala of wholeness to those who feel fractured. Alium helps us to honor each part of a whole without losing sight of the larger structure. The blossoms which make up the large ball of the flower have a high silvery note of sound, and through the essence, or meditation with the bloom can bring us to another realm of physical reality. Aquarian overtones. (Prunus Communis) The flowering Almond tree is a treasure and his essence is connected to a sense of plenty. There is a moment when we are ready to acknowledge and be grateful to the plenty of the earth which Almond brings into our consciousness. At this moment we open to our own treasures internally as well. We can acknowledge our wealth and feel the optimism necessary to prosper. (Angelica archangelica) Angelica is useful at times of fear and disconnection from the continuity of life. She heightens consciousness of the angelic realm and of other guides. Angelica can bring back spiritual connection to Nature and take us over the threshold at moments of initiation. Angelica has a special bond to the season of Samhain (Hallowe'en). The root is carried by Druids during this festival when the connection between death and life is honored. Angelica reminds us the demons we fear may be of our own making. Particular to the season of Samhain (Scorpio), but with a special affinity for Moon/Pluto aspects. Mugwort Artemisia is powerful representation of the Moon and is named for the Greek Goddess of the Moon, Artemis. Her essence offers us a huge variety of healing energies. Try Artemisia to develop powers of divination, to sort out confusion, to heal strange ailments. Artemisia is our Aunt who answers puzzling questions and knows what to do in any number of quandaries. She can be used to bless a house or a new crystal or magical tools. Artemisia can warm us and cool us. She is a good essence for dreaming powerful dreams, for shamanic work for putting together what has been shattered. This foaming pink flower, which grows in shady parts of the garden seems to cleanse and purify. We can call upon her to help us sort and release what is no longer needed. She is heartfelt in her action, but not retentive. Like a new broom, she sweeps away the dusty corners. Virgo or 6th House issues. (Rudbeckia hirta) She is an organizing essence, ready to mend the broken circle. Helps to refocus on life tasks after a period of care for others. Also useful to those who are unconscious or unwilling to acknowledge their own pain from trauma, but instead keeps a watch over others. (Clereodendrum thomsoniae) When the heart cannot let go of the sorrows of love, Bleeding Heart helps to loosen that grip. She can also be useful in finding a way of expressing love which has been held silent for too long. A good essence for those who need to honor their own or others vulnerability. Bleeding Heart allows for heart opening and clearing. Venus in Pisces connection. (Borago officinalis) For a deep sense of safety, Borage is a wonderful essence. He brings the gift of courage and optimism and so the connection to Jupiter. Borage lifts depression especially when carried in the physical body. His bright purple stars lift above ground hugging stem and leaves suggesting a grounded joyfulness. (Ranunculus acris) Here is an essence for those who feel they are not living "important" lives. Buttercup is a Sun fully aware of its bright and shining source, but also aware of its place among a meadow of Suns. Buttercup balances a sense of individual self-worth with a joyful awareness of humbleness. Self expression is found in service to others. Power and healing are found in simple pleasures. He brings relief to those who take themselves too seriously. Issues of Sun/Saturn or Capricorn. (Silenus cucubalus) Campion is a help to the scholar and the student, but most particularly the student of the countryside. He helps us to learn from plants and stones and connects us to the wisdom of the ancestors which has been left behind. Think of him as a wondering monk, a Druid on a pilgrimage to study a sacred site. He is associated with the teacher quality of Saturn. Chinese Lantern (Physalis alkekengi) The bright blossoms of the Chinese Lantern plant are just as charming as the more familiar bright orange fruit which he bares in late summer. Perhaps they are the light inside the lanterns. Helpful for those who choose to work with occult studies. Chinese Lantern helps pierce the veil of esoteric systems. Mercury, Uranus contacts. (Cosmos bipinnatus) A flower available to help with �cosmic� issues. So simple in appearance and yet Cosmos has the powerful ability to sort out confusion and put things in order. His delicate leaves mimic the multiple branching of the circulation and nervous system. Yet the blossom appears as a simple organizing structure, a junction of these diverse energies. Cosmos has the gift to integrate body and spirit so neither outruns the other. Clarity, and sharp focus are some of the gifts of Cosmos. Mercury in Aquarius. (Caltha palustris) A bright yellow member of the buttercup family, Cowslip blooms in the early springtime and grows in streams and brooks. Cowslip radiates good humor and joy like the Sun of the early morning. Here's a wonderful essence to begin a project or piece of difficult work. Growing and blossoming in the swift moving water of the stream, Cowslip is juicy and herbally used for sweating, a diuretic, a laxative and a cough medicine. Use her essence to get the juices flowing again, wash away blocks and contact the creativity of the life force of early spring. (Narcissus) Who are you? And what is your message to those around you? The ability to look inward and turn towards others is the gift of Daffodil. It provides balance for those who spend too much or too little time with the inward journey. Daffodil opens the way to communicate--not always in words--who we are and what we have to offer. (Taraxacum officinale) This little sun brings courage and endurance to those who feel worn out or discouraged. Dandelion reminds us we have right to be here. Also an excellent essence for those who are hindered by their own shyness. Dandelions are so prevalent, they can be guides to remind us of our need for heart and courage whenever we see them. They are also excellent purifiers of intention, allowing us to look carefully at our deepest motives and impulses. Venus in Leo. (Allium sp.) Egyptian Onion opens the gate to the palace of the Moon. Here the most ancient rites are remembered and honored. Egyptian Onion connects us to the Moon's cycle in our daily lives so we have a sense of guidance and purpose. Egyptian Onion reminds us of the masculine side of the Moon and of the role of priest of the Moon. He can help men who feel drawn to the energy of the Moon and don�t have a comfortable outlet for their connection. It is a good essence for issues of Mars in Cancer. It is a good essence for issues of Pluto Moon contacts. (Crataegus pedicell) Hawthorn is an essence to cleanse, purify and open to the Faerie Kingdom. An excellent accompaniment to a Beltane (May Day) celebration, Hawthorn combines the austere and cleansing aspect of the season with the connection to nature realms and to a time of celebration of fertility and blossoming. She honors and protects the innocence of childhood and washes away what has sullied our sense of wholeness. Venus/Scorpio. Honeysuckle With its twisting, turning vines, Honeysuckle helpe us follow our guidance to the center of the labyrinth. Here we find the 'way' to discover who we truly are, the inner self. The way through the labyrinth is both ancient and difficult to discern. Honeysuckle is associated with poets and poetry. Poems do not go at the truth in a straight line. They spiral and twist until we come to the heart of the meaning, see it and lose it around the next corner. The bird associated with this plant is the lapwing, which will fly straight into the air when her nest is approached. She represents the distraction which keeps the inner treasure from discovery. The flowers of the honeysuckle are also curly and grow in a spiral form. Their sweetness draws the bees and they become especially fragrant at twilight to call in moths and other night flyers. Dr. Bach used Honeysuckle for those lost in nostalgia. The Star Flower Alchemy Honeysuckle may have this effect as well, but it seems more useful for guidance in the inner journey. Mercury's flower. Impatiens Impatiens reminds us to take time to 'smell the flowers.' It is for those who are always on to the next thing, never having time for the here and now. Impatiens asks for patience with the pace of our own development, and tolerance for the pace of others. A good balance for those who are have so much Mars in their chart they can't slow down. (Alchemilla molis) When there is even the slightest amount of moisture to be gathered, the leaves of Lady�s Mantle hold droplets of dew, mist or rain. It is a plant of the alchemists who gathered dew in sheets, and carries the name of Alchemilla because of her connection to this process. I used the moisture of the leaves in making the mother essence of this magical flower. This essence is treasured by those who yearn for a return to source, who have lost hope, who need the dew of the fields to restore them to their true purpose. She offers protection and solace. Lady�s Mantle can be used in sacred formulas or as healing for the exhausted and discouraged. She is especially powerful at the time of the spring equinox when the Lady walks the land with her mantle held wide, each footprint filled with trefoils and flowers. Lightning Water I made this essence by using the water which fell during a violent thunder and lightning storm. I was particularly concerned with trying to help dogs terrified of electrical storms. However, I have found it to be a source of inspiration as well, energizing and enlightening. It seems to be helpful with Uranus passages, allowing the energy of that time period to be used with appreciation. (Lysimachia punctata) For those who need help "taking up space." This beautiful white flowering plant spreads easily, and has a generous spirit to share with those who feel constricted by circumstances or their own inhibitions. Helpful in difficult Saturn situations. (Solanum nigrum) For those ready to explore the realms of Hades, to look upon deep despair, to acknowledge mourning. These purple flowers take the shape of shooting stars and light the way into, and out of grief. The essence of Nightshade gives us the impetus to travel deeper and farther into old issues. (Phytolacca americana) Pokeberry grows a long stem which will simultaneously contain, blossom, green berries and ripe black berries, a clear description of all the stages of development. It is a wonderful aid in times of deep transformation when the past is still part of the new growth. Pokeberry is helpful during the transition from one stage of life to another, providing the ability to see what has been already accomplished as well as what steps lie ahead. This is an essence particularly useful in adolescence. It allows the person to see herself as a work in progress, part child, part adult. It�s also helpful during menopause or during long and difficult outer planet transits. (Prunella vulgaris) This humble, low growing mint can be found in lawns and wet places near streams and lakes. She has a stalk of small purple flowers, and is a member of the mint family. Prunella flower essence has the ability to start or strengthen our innate power of healing. She supports our inner process of repair and soothing for the body through our deep desire to be well and to enjoy life. She is sacred to Jupiter who gives us the optimism to heal. Red Rose Red Rose is an essence for those who feel they will never find a love of their own. Red Rose reminds us of the power of love and the magic of Venus. When we accept the whole of Red Rose, thorns and all, we are ready for love. Red Rose essence taken over a period of time opens the heart. Vulnerability proves to be an asset rather than a source of wounding. Red Rose is the symbol of the heart�s blossoming as we trust our desire to bring us what we need most. Rowan Rowan is another connector to a celebration of the Druid year. This time it is to Imbolc, February 2nd. We see in the bottom of the Rowan berry the pentacle of protection which is promised by the Goddess, Brighid, who is honored in particular at this holiday. Brighid or Bride is the patron of birth, poets, healing and blacksmiths. She has connections to the Moon and to the knowledge of the Moon's cycles. Turn to her for inspiration as an artist, a woman about to give birth, a healer or a craftsperson. ( Hypericum perforatum) St. John�s Wort grows in bunches of bright yellow star flowers which begins to bloom around the time of the Summer Solstice, and thus the name St. John�s Wort because June 24th is St. John�s Day. It is for the use of those who want to experience the embodiment of spirit in physical form. It is a an essence of great brightness and joy. It can literally bring sunshine into the body and is a good essence for those suffering from SAD. Of course the connection to the Sun in the chart is very strong and works well with those who have afflictions to their Sun in the natal chart or by transit. (Antirrhinum majus ) Snapdragon relieves tension around communication. It is useful when you are preparing to say something important or to make a verbal presentation. It combines the courage to speak up with a sense of relaxation about your ability to say what you must. Snapdragon would be a helpful essence when you are obsessed with ideas and can't find the opportunity to communicate them in a way which satisfies you. Snapdragon will also help you to feel your words and their possible impact before you speak. In other words, they may help prevent "snapping" at someone when you were simply immersed in your own thoughts. Snapdragon essence is helpful for tension held in the jaw and mouth area. Has been useful in clearing Bell's Palsy and TMJ. (Galanthus elwesi) Snowdrop is the earliest blossom of spring. Oblivious to the snow which may be still on the ground, it sends up bell like flowers to welcome the change of season. It looks delicate but has great stamina. It is an essential part of the Druid celebration of Imbolc (February 2nd) and provides faith in the natural cycle of seasons to bring new life from the dark earth. Snowdrop offers courageous optimism, the mystic who must act upon vision. A good essence for those working on goals and future plans. Mercury and Venus in Aquarius. (Tanacetum vulgare) Tansy is good for those who need to see the natural magic in life. It can reconnect you to the seasons, and to the delights of the whole yearly cycle of change and transformation. It has a traditional connection to long life, and I think this may be part of the appreciation for the complete cycle of the year. She would be a good essence for those studying and practicing earth spirituality. The flowers are clumps of tiny cups which remind me of the celebration suggested by the Three of Cups in the Tarot deck. (Campsis) Trumpet Vine broadcasts the personality without a microphone. He seems to magnify any efforts made to speak up. Helpful to those trying to establish communication through some form of artistic or other non verbal expression. It�s also useful to those struggling to explain, teach or publicize some difficult concept. Trumpet Vine has worked well with clients yearning to express themselves in public or in social situations. It is useful with Mercury/Saturn contacts. (Chelone glabra) Turtlehead helps when you are ready to stick your neck out of your protective shell. It�s an essence for those who feel they have waited too long to say or do what they want. It gives courage with the full knowledge of the fears which kept you contained in the first place. (Achillea millefolium) Yarrow has an ancient tradition as a channel for the voice of spirit into the hearing of those who listen through its hollow stem. He is connected with the fire element, and the cleansing power of fire. Yarrow was used herbally to clear fever and stop bleeding It will make a shield around those who need protection from some aspect of the environment which is toxic, and so is excellent in working with allergies. Yellow seems to work directly on clearing the aura, cleansing, shielding. White be for those who need to feel the power of loving purification, Yellow for those who are ready to shine. Jupiter/Sun expression. Yucca Yucca is an excellent remedy for those who are homesick or who feel they don�t belong anywhere. It�s good for travel, especially long trips, and for those who must move away from a beloved home. It is also indicated for those who do not feel the earth is their home. Connection to Venus or the Moon in Cancer or the 4th house. Last updated January 4, 2010. Site Maintained by Monique Leonard. Copyright 2009, Sarah Fuhro. All rights reserved. Site designed by Deborah O'Hanlon. Card Illustrations on this page are by Will Worthington, willworthingtonuk@hotmail.com and may not be reproduced without his permission.